After nearly a month of fiercely contested play, the World Chess Championship is being decided in a series of fast-paced tie-breakers. Fabiano Caruana hopes to become the first US champion since Bobby Fischer in 1972 - but faces world number one Norwegian Magnus Carlsen in London. Caruana and Carlsen are playing four games with just 25 minutes on each player's timer at the start and 10 seconds added per move. 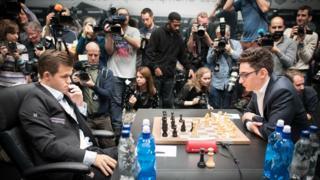 If neither contestant comes out ahead after those games, the match format shifts to "blitz" chess - with just five minutes on the starting clock, and three seconds a move. Even for the world's two best players, the tight time pressure can lead to mistakes. They will play two games a match like this - up to a maximum of five matches if they keep drawing. The drawing of lots is crucial in this "sudden death" variant - the player with white pieces gets five minutes on the clock, and black receives only four. If, despite the intense speed of the game, it once again ends in a draw, the player holding the black king is declared the winner - and the new world champion. "Before the game he decided that draw was what he wanted and even when something more was possible he didn't want to go for it," grandmaster Alex Colovic wrote in an analysis piece for Chess.com. The reason may be simple - while Carlsen and Caruana are ranked numbers one and two in the world for regular play, that's not the case for fast-paced "blitz" chess. There, Carlsen remains the world's top-ranked player - but Caruana drops to spot number 18. After Monday's offer of a draw, former world champion Garry Kasparov tweeted that he thought the Norwegian was losing his nerve. Twelve draws in 12 games of regular play is a record for a championship battle - with not a single victory in regular play. "The match has made history, though of an ignoble kind," the World Chess broadcast's tournament report said, reflecting the frustration of some viewers after so many draws. But Wednesday's game structure means that no matter what, there will be a new champion - even it it takes until Armageddon.